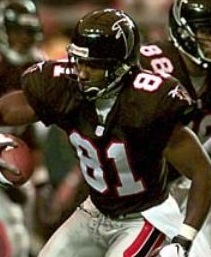 The NFC Divisional Playoff game in Atlanta on January 9, 1999 featured two NFC West teams. The upstart Atlanta Falcons had topped the division with a 14-2 record while the San Francisco 49ers finished second at 12-4 and were the top Wild Card entry. The rise of the Falcons had been stunning in that they were coming off of two losing seasons, and five of the previous six had resulted in records under .500. Head Coach Dan Reeves, previously with the Broncos and Giants, was in his second year with the club but underwent heart surgery in December and was just returning to the sideline a month later to coach in the playoffs. The offense was ball control-oriented, keyed by RB Jamal Anderson (pictured above), who rushed for 1846 yards on a record-setting 410 carries. QB Chris Chandler was unspectacular but efficient and a good leader. The defense featured a solid line plus Pro Bowlers in MLB Jessie Tuggle, CB Ray Buchanan, and FS Eugene Robinson. San Francisco, coached by Steve Mariucci for the second year, was used to contending, having reached the playoffs for the seventh consecutive year in 1998 and 15th time in 16 seasons, with a Super Bowl victory as recently as 1994. The team was aging but still strong with 37-year-old QB Steve Young and 36-year-old WR Jerry Rice leaders of an offense that benefited from the presence of RB Garrison Hearst (1570 rushing yards) and third-year WR Terrell Owens. The defensive line was missing injured DT Bryant Young, but DE Charles Haley came out of retirement to lend his pass-rushing expertise. The teams split their regular season meetings and the 49ers defeated Green Bay in the Wild Card round the previous week to advance to the Divisional game. There were 70,262 fans in attendance at the Georgia Dome. Things went badly for the 49ers on their first play from scrimmage when Garrison Hearst suffered a broken leg, which significantly affected their ability to run the ball for the rest of the game. 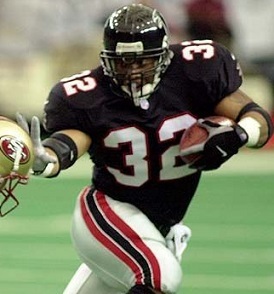 The teams exchanged punts until, following a 36-yard return by WR Tim Dwight, the Falcons took possession at the San Francisco 38 and scored in six plays. Jamal Anderson ran for 14 yards on first down and Chris Chandler threw to WR Terance Mathis for 19 yards on a third down play to the three yard line. Two plays later, Anderson ran for a two-yard touchdown, Morten Andersen added the extra point, and Atlanta held a 7-0 lead. The clubs returned to trading punts as the game headed into the second quarter. Starting from their 18 with 7:35 remaining in the first half, the Falcons advanced 82 yards in seven plays. Jamal Anderson rushed for 16 yards on his first two carries, Chandler (pictured below) again connected with Mathis for 19 yards, and then it was Anderson breaking away for a 34-yard TD. Morten Andersen again added the point after and the home team was up by 14-0. The 49ers responded with an 80-yard possession of their own. A pass interference call was good for 16 yards and Steve Young completed passes to WR J.J. Stokes for 12 yards, but the advance was nearly derailed when RB Terry Kirby mishandled a lateral and, after DE Chuck Smith appeared to recover and ran for an apparent touchdown, it was ruled that Kirby had gained possession and was down by contact before the ball got away from him again. Making the most of the reprieve, Young then threw to RB Chuck Levy for 34 yards and TE Greg Clark for nine before hitting Jerry Rice for a 17-yard touchdown. Wade Richey narrowed the score to 14-7 with the successful conversion. There was still 1:06 left before halftime as the Falcons regained possession, but after Chandler passed to WR Ronnie Harris for 22 yards, his next throw was deflected by Charles Haley and picked off by DT Junior Bryant. San Francisco now had the ball at the Atlanta 36 and Young threw to Stokes for 16 yards and ran once himself for seven to set up a 36-yard Richey field goal. Atlanta’s lead was 14-10 at the intermission and the Niners appeared to have the momentum. The Falcons had the ball first and drove to the San Francisco 42, but attempting to convert a fourth-and-one situation, Anderson was stopped for no gain. Now it was the 49ers moving effectively as Young threw to Terrell Owens for 20 yards and to Rice for eight. But following a short gain on another completion to Owens, Young’s next pass was picked off at the Atlanta three by Eugene Robinson, who returned it 77 yards to the San Francisco 20. While the turnover didn’t lead to a touchdown, it did lead to a Morten Andersen field goal from 29 yards and, instead of the Niners potentially taking the lead, the Falcons were ahead by seven points at 17-10. San Francisco had the ball heading into the fourth quarter and Young threw to Rice for a 38-yard gain to the Atlanta 44, but once again the Falcons came up with an interception. This time it was SS William White picking off Young’s pass intended for Clark and returning it 14 yards to the San Francisco 36. 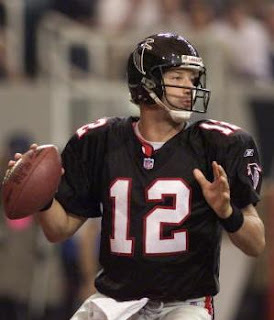 Chandler converted a third-and-eight situation with a toss to WR Tony Martin that picked up 16 yards and, while the drive bogged down inside the 20, Atlanta again came up with points on a 32-yard Andersen field goal. With Young completing seven passes, the 49ers advanced 87 yards in 13 plays in response. Two were to Owens, one of which gained seven yards in a third-and-five situation, and two more were caught by Stokes, the longest for a 33-yard gain to the Atlanta 12. Young kept the ball himself on an eight-yard scramble for a touchdown carry and the Niners added an improvised two-point conversion when the holder for the placekick, QB Ty Detmer, had to leap for a high snap, rolled out, and connected with Clark. It was now a two-point contest with 3:57 to play. The try for an onside kick failed and, with Anderson running on every play, the Falcons managed to hold onto the ball until punting with 49 seconds left on the clock. The 49ers had to start from their own four and, while Young was able to connect with Levy for a gain of 24 yards, the game ended with White intercepting one last Young pass to seal the 20-18 win for Atlanta. The 49ers had more total yards (334 to 289), but without Garrison Hearst gained just 46 yards on the ground, to 136 for the Falcons, who had the edge in first downs (16 to 15). San Francisco also turned the ball over three times, to one suffered by Atlanta, and the 49ers were penalized eight times, to six flags thrown on the Falcons. Chris Chandler didn’t go to the air often, completing 13 of 19 passes for 169 yards and giving up an interception. Jamal Anderson rushed for 113 yards on 29 carries that included two touchdowns. Terance Mathis (pictured at right) topped the Atlanta receivers with 5 catches for 71 yards and Tony Martin was right behind with his 63 yards on four receptions. For the 49ers, Steve Young was successful on 23 of 37 throws for 289 yards and a TD, but also gave up three interceptions. He also led the team with 28 yards on six rushes that included a score. Terrell Owens caught 8 passes for 73 yards and J.J. Stokes contributed 76 yards on his five receptions. Jerry Rice had three receptions for 63 yards and a TD and set a NFL record by catching a pass in 23 straight playoff games. The Falcons moved a level higher as they upset the Minnesota Vikings in overtime to win the NFC Championship. However, they lost decisively to Denver in the Super Bowl and returned to earth with a 5-11 record in 1999. The loss for the 49ers marked the end of a long and successful era as they dropped to 4-12 in ‘99. They next returned to the postseason in 2001.